Be the first to share your favorite memory, photo or story of Sarah Elizabeth . This memorial page is dedicated for family, friends and future generations to celebrate the life of their loved one. 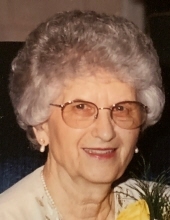 Mrs. Sarah Elizabeth Mabry Pannell, age 92, of Mize Road in Toccoa, Georgia passed away Saturday, January 19, 2019 at the home. A daughter of the late Otho and Mae Elise Adams Mabry, she was born January 6, 1927 in Fulton County, Georgia having lived most of her life in Toccoa. She was a vice-president at Regions Bank, where she retired after many years of service. Mrs. Pannell was a member of Toccoa Presbyterian Church where she formerly served as a church elder and church auditor. She was preceded in death by her husband, Mr. Guy Pannell (2010). Survivors include three sons and daughters-in-law, Kenneth and Sue Pannell of Kernersville, North Carolina, Louis and Emily Pannell of Hoschton, Georgia, and Roger and Elena Pannell of Marshfield, Massachusetts, five grandchildren and spouses, Kimberly and Allen Warf, Jennifer and Carlos Solano, Tara Pannell, Brian Pannell, and James Pannell, a brother and sister-in-law, Curtis and Linda Mabry of Hollywood, Ga., a sister and brother-in-law, Joyce and Wayne Bleckley of Toccoa, a step grandchild, Vickie Stevens, great grandchildren, Hunter Warf, Austin Warf, Benjamin Haddad, and George Patrick Solano, step great grandchildren, Markki Stevens and Zachary Stevens, and a step great-great grandchild, Killian Vance. Funeral services will be held Wednesday, January 23, 2019, 2:00 P.M., at the Hillcrest Chapel at the Acree-Davis Funeral Home with Reverend Tommy Childress and Reverend Gary Pierstorff officiating. The family will be at their respective homes and will receive friends Wednesday at the Acree-Davis Funeral Home from 12:00 Noon until the service hour. The family respectfully requests that in lieu of flowers memorial donations be made to Amedisys Home Health Care, 53 Rock Road, Toccoa, Ga. 30577 or to Toccoa Presbyterian Church, 205 East Tugalo Street, Toccoa, Ga. 30577 in memory of Mrs. Sarah Mabry Pannell. Please visit www.acree-davisfh.com to send an online condolence to the family. Interment will be in Stephens Memorial Gardens following funeral services. The Acree-Davis Funeral Home is in charge of funeral arrangements for Mrs. Sarah Elizabeth Mabry Pannell. To send flowers or a remembrance gift to the family of Sarah Elizabeth Mabry Pannell, please visit our Tribute Store. "Email Address" would like to share the life celebration of Sarah Elizabeth Mabry Pannell. Click on the "link" to go to share a favorite memory or leave a condolence message for the family.